Awhile back Joe and I ate at a Mexican restaurant where they served Charro Beans on the side. That first bite brought back memories of something my Mom used to make. Only she called them Chuckwagon Beans and I remember asking her to make them. 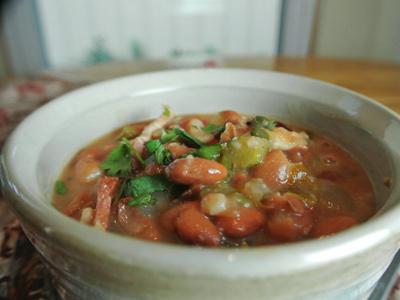 I looked up an old index card with her handwritten recipe and found that she seasoned her pinto beans with cooked bacon, onion, green chiles and tomatoes. Of course out on the farm we rarely had a meal without a pot of beans on the table, but I remember the Chuckwagon beans as special, much more flavorful. Since Joe doesn’t like beans I kind of got away from the pinto’s over the years. I pulled out Mom’s old recipe and tried it out just to see if it tasted like the charro beans and I’m happy to say they were pretty darn close. Thanks Mom. . . for the recipe and the memories! To this day my Mom still soaks a pot of dried pinto beans and cooks them in a pressure cooker. Me, I don’t have the patience and used canned pinto beans. Plus some chicken stock, bacon, onion, green chile, jalapeno, tomato, cilantro and salt. 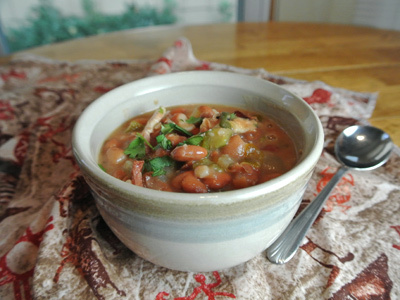 You can use canned green chile or frozen but I wanted the flavor of freshly roasted chile. I roasted the chile and jalapeno until they were charred on all sides then set in a plastic bag to steam for 20 minutes. The skin virtually rinses off under running water. After they have been peeled, seed them and chop. **I only used 1 1/2 chiles but roasted a few more for another recipe. 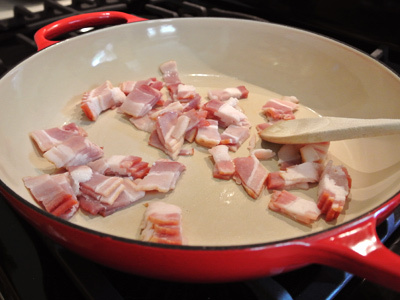 In a large skillet or dutch oven, cook the bacon pieces until they are crisp and browned. Set the cooked bacon on a paper towel to blot and reserve the bacon grease in the skillet. 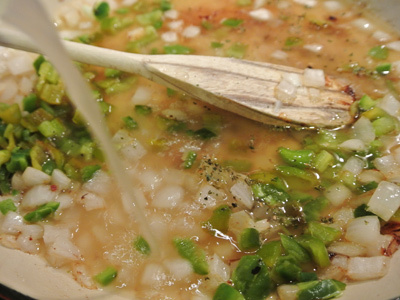 In the reserved bacon grease, add the chopped onion and saute until it becomes soft and translucent. Add the chile and jalapeno to the pan and stir. Oh, I almost forgot the Epazote, it’s a must for most all bean recipes. 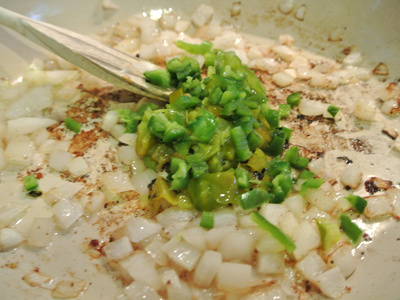 Add 1/2 teaspoon to the sauteed onions and chiles. Add a cup of chicken stock. Pour in the 2 cans of beans. 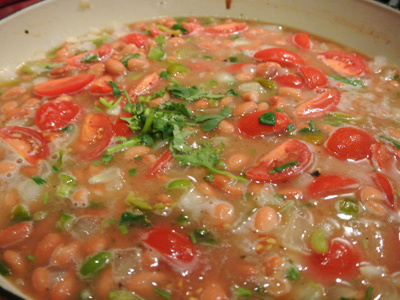 Charro beans are sometimes called soupy beans and they need to thicken just a little. 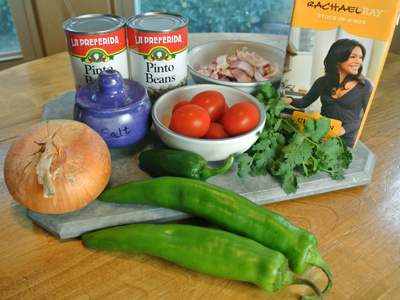 Take a potato masher and mash up a portion of the beans in the center of the skillet. Stir the mashed beans in with the rest of the mix and they will thicken considerably. 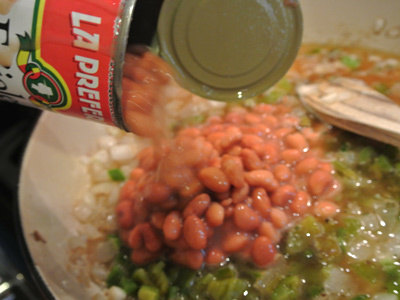 Once you are about ready to serve, add the bacon back into the beans. The bacon will stay crisp longer if you add it last. 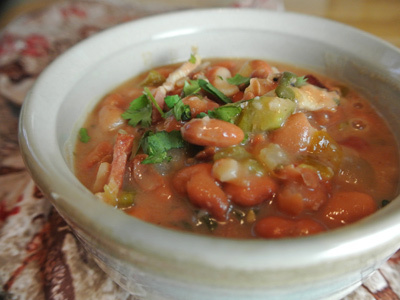 Charro beans can make a complete meal with warm tortillas or cornbread or as a side dish. In a large skillet or dutch oven cook bacon pieces over medium high heat until crisp and browned. Remove bacon pieces to a plate lined with a paper towel. Leave the bacon grease in the pan. Reheat pan and add chopped onion. Saute over medium heat until soft and translucent. Stir in the chiles and epazote. 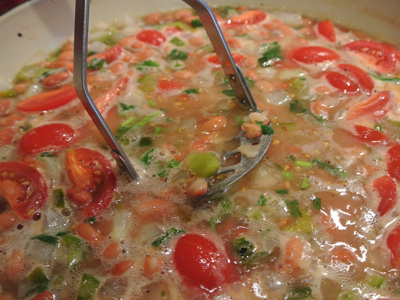 Add in the chicken stock, beans, tomatoes and cilantro. Heat just to a boil, then turn the heat down to medium low. 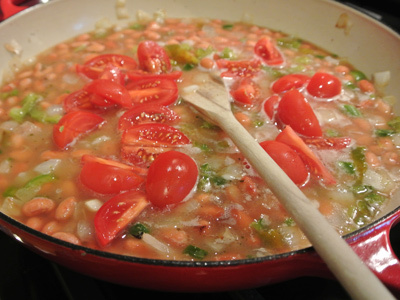 To thicken the beans take a potato masher and mash a portion of beans in the center of the pan. Cover the pan with a lid and simmer for 15 – 20 minutes. Add the cooked bacon back into the beans. Salt to taste. This looks delicious! I’ve never heard of Epizote. Is it some kind of spice blend? friendlier. You can use fresh or dried but fresh epazote is harder to find and I’ve heard has a stronger taste. 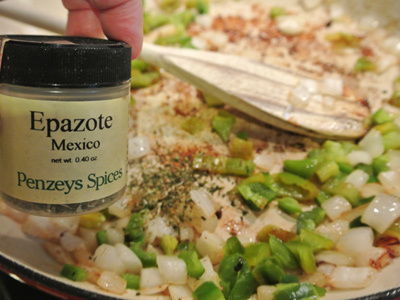 I’ve been using Penzey’s epazote for years and it does help with the digestion. Wow, this looks amazing Jan! Love the bacon and anaheim chiles in here. I’m usually not a fan of just bean dish but this looks delicious!!! My thoughts too! 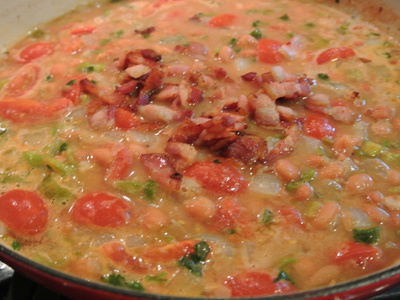 Beans by themselves can be boring but adding some spice and especially bacon adds so much flavor to the pot! Tomorrow, Tomorrow, I’m making this Tomorrow!!! Thanks for dropping by, let me know how it turns out! 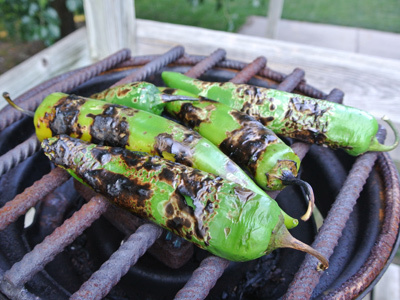 I am grilling pork chops, corn on the cob and serving those…..oh I can’t wait! Sounds delish! When should I be over?